Video chat on your TV - a step closer to Star Trek? Skype is a wonderful thing, bringing together people all around the world for free but using it you usually have to be tethered to a computer. Well, this is all about to change with the announcement at CES 2010 that Skype is coming to your TV in the near future. That is, if your TV is made by Panasonic or LG. Both companies used CES 2010 to show off just how multi-tasking their TV sets are with the use of Skype, via an app, on the big-screen. 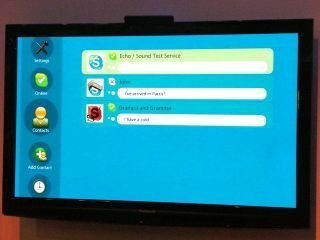 What is needed is a webcam which slots on the top of your TV set and connects through a TV's USB port and the Skype app. Panasonic is offering up the app, via its Viera Cast service, while LG is also offering it as a widget. The actual interface of Skype on TV is great, and beats squinting at the small video box you get when loading up Skype on a laptop. While the image of the person you are speaking to has a lot to be desired, it is still something which is very much welcome. The Wi-Fi-enabled TV's compatible with Skype are out in America later in the year (around July time), so expect to see Skype on the big-screen in the UK around Christmas time.